Leveraging Internet & Social Media For Improved Results - Like it or not we live in a technology-driven world. You want to sell your home for the most money that you possibly can and as quickly as you possibly can; right? Leveraging technology, especially mobile internet and social media, is a key ingredient for success in today's real estate market. Integrity, professionalism and knowledge are all vital criteria to use when selecting a real estate professional. Today we must add another key ingredient to the mix... does your real estate professional leverage technology fully while marketing your home? You wouldn't ask a wagon-maker to build you a car. Don't choose a Realtor that ignores technology when selling your home! Over 90% Of Home Buyers Begin Their Home Search On The Internet. Thousands Of Buyers Visit Our Website & Online Listings Every Month. Our Seller Clients Obtain 98% Of Asking Price On Average. Get your home sold quickly for maximum value! When we market your home, we create a comprehensive marketing strategy that guarantees maximum exposure for your property to find a qualified buyer for your home and to close the transaction. Contact Dave or Brian at (949) 218-0952 for a free consultation. The Price Is Right! First, We'll help you price your house right so you can sell it quickly, and for the maximum value. It all starts with the right selling price. Our intuitive understanding of market conditions coupled with a careful examination of recent sales data will help you choose the right price. The right price will always net you higher offers and a quicker sale! We will not leave any money on the table. We will not waste your time! Dress For Success! Second, We will help you "dress" your home for success. Did you know that "dressing hour home for success" can add thousands to the selling price and result in a quicker sale? We will provide you with proven strategies that will lead to a quicker sale. Plus, Dave and Brian will show you how to break the seemingly overwhelming process of preparing your house for sale into small manageable pieces that you can accomplish quickly and easily. 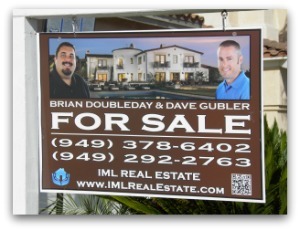 Alert REALTORS® Via Email - Since Orange County realtors are working with the local real estate buyers, we immediately e-mail top producing Orange County real estate agents a compelling flier with photos. Alert Area Real Estate offices Via Print - We deliver color information sheets to area offices featuring your property. Immediate listing in the MLS Database - Your home will be immediately listed in the Multiple Listings System (MLS) database the day you sign your listing paperwork and we will post professional quality photos and visual tours to showcase your home. Buyers using our automated property notification email system will immediately receive notification of your new listing too! Go To The Extreme! Fourth, we market your home directly to the home-buying public in dramatic fashion. www. "YourAddressHere".com - A custom web page is created for your home and another is also featured on IMLRealEstate.com with the custom property web site address featured in all of our print advertising complete with professional quality photos and/or a 360 degree virtual tour. Every selling point of your property is presented to viewers worldwide. We use professional quality wide angle lenses and optimize your photos for both print and the Internet so your home will looks it's very best! Here are some examples... www.2BlackCherryStreet.com, www.11RueFontaine.com, and www.24bienvenue.com. QR Codes On Signage & Other Marketing Materials - Mobile device users want information in real-time and if it isn't available... they will skip to the next home. Try the QR Codes below with your mobile device. Internet Marketing - Major Real Estate Portals - We understand the Internet and invest heavily in search engine marketing to make sure your home will be found online! More than 90% of home buyers turn to the Internet to start their home search. We make sure your home is featured on the most visited Web sites where Orange County home buyers are shopping for homes. Your home will be featured on nearly EVERY major real estate portal including: Facebook, Google Base, craigslist, Realtor.com, Trulia, Zillow, Yahoo Real Estate, AOL, MSN.com, Homes.com, AltaVista.com and many more. www.Realtor.com - Yes, of course your home is listed on this site, not as a standard real estate listing, but as a Showcase Property with photos, expanded detailed information, and/or virtual tour. In addition, we subscribe to Realtor.com's Featured Homes Program. Featured homes generate on average twice the viewership - sometimes exceeding 1000 page views per week for your property. 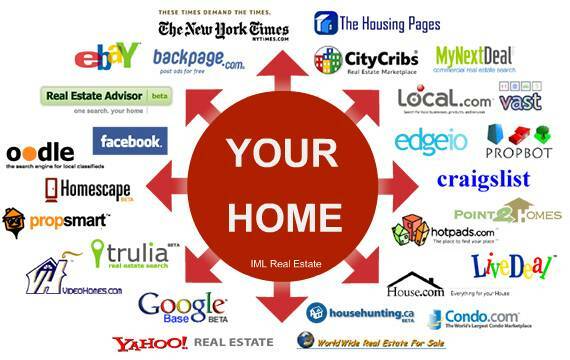 Your home is also featured on up to 10 additional Web sites! Premium Yard Signs with Flier Boxes - Knowing 70% of local buyers drive through neighborhoods, we stock all signs with color fliers on a weekly basis. 24 Hour Recorded Message and Call Capture - Detailed information and an automated property brochure FAX-back system. Allows buyers to access property descriptions without having to speak to an agent directly. Caller's phone number is captured so we can call back while interest is highest. Loan Pre-Approval System - Buyers choose from our "Preferred Lenders" list and are pre approved prior to beginning their home search. Buyer Profile System - Your home is exposed to a group of highly qualified and interested buyers who have expressed criteria which match the features of your home. Open House Advertising - Open houses can generate interest awareness ahd traffic to your listing with buyers and agents. When appropriate we will feature your home in newspaper ads and hold open houses. Staging Assistance - We will help you prepare your home for sale and stage your property for showings. We use the Dress Your House For Success program and can walk you through every step of the way. Pricing Assistance - We will prepare a comprehensive market analysis for you showing what you can expect to receive for your home in today's market. We will show you what has sold, what your competition looks like as well as what didn't sell and why. We will update you throughout the selling process to be sure you achieve your goals for selling your home within your timeframe. We assist you with completing an easy, stress-free transaction. During the listing and marketing of your Orange County home, we'll assist you step by step through the selling process to make your experience easy and stress-free. We assist you with negotiating the best deal with buyers. We'll help you sell your home quickly by finding out what buyers think about your house, so you can make adjustments to get maximum value. We'll help you get best price for your property by treating your transaction as if it's my own property, and assist you with getting the maximum price in today's market. Tap in to our Premier Marketing Plan. To help you increase demand for your home and attract people who are willing to spend the money you know its worth, we outspend most agents on advertising. Both in print and online, we aggressively promote your property to Ann Arbor are home buyers. Use my investment in marketing, communications, and technology to bring you more money, faster, and with professional, personal service. Professionally assess your needs, wants and plans. Develop and implement a complete marketing plan. Help you prepare the property for staging and showing. Provide pricing research and consult you on the terms of all offers. Consistently provide feedback, update market information, and consult on the best options, throughout the home sales process. Coordinate your move, in whatever way you would like. Provide post-closing information, consulting, and services and be available to assist with any future real estate needs. Request A Free Home Valuation Report What is your Orange County home worth? How much should you sell it for in today's market? We'd be happy to assist you by providing you with a free Home Valuation Report" to find out your home's value. Plus, we'll give you a free report: 50 things you can do to increase the value of your home. Why we are your best choice to help you get your home SOLD! All of our services are provided FREE, without cost to you, until we deliver what we promise! Questions? Call us at (949) 218-0952, or click here to Email Us.